Nintendo just finished a thirty minute Nintendo Direct that was dedicated to the upcoming Smash Bros game for Wii U. Nintendo released Smash Bros for 3DS on October 3rd and the reaction shook the gaming community, with over 2.8 million copies sold of the 3DS version. The Wii U version is set to be released in North America on November 21st. There’s a lot to cover so let’s dive right in! Here’s all 50 facts released in the recent Nintendo Direct. 1. Over 40 fighters on the initial line-up, making it the largest roster of any Smash Bros game to date, including the 3DS version. Plus, all the move sets are the same between the two versions. 2. The Nintendo 3DS version features 400 x 240 resolution, while the Wii U version features 1920 x 1080 resolution. 4. …certain stages that are larger than normal to support such a mass of mayhem which include Palutena’s Temple, Big Battlefield, and the fan favorite Temple. 5. The Great Cave Offensive. A new stage that is based on the Underground Labyrinth from Kirby Super Star. Around the stage are Danger Zones that inflict damage upon contact and KO’s any character that makes contact with a damage percentage over 100%. 6. A new stage called Jungle Hijinks from Donkey Kong Country Returns with a foreground and a background for fighting. Barrels send characters from the foreground to the background. In the background, players fly farther. 7. The Wii U version will have the largest number of stages, including a bunch of new ones. 8. A new unfinished stage that will be released later called the Miiverse stage that shows Miiverse posts of the fighters being used. 9. Pit’s downward taunt (only on Kid Icarus stages) will now trigger a Kid Icarus style conversation between Pit and Palutena and other Uprising characters. This function also applies to Star Fox characters to see a conversation with the character and other Star Fox characters only on Star Fox stages. 10. Gaur Plain, a Xenoblade stage, now turns to night and the character Metal Face appears and attacks players and can be KO’d. 11. Ridley is confirmed! Sort of… He appears on a new Metroid stage and attacks players. If a player does enough damage to him, he will join that player and fight with him. He can also become Meta Ridley. If the player KOs Ridley, it counts as a point to the player. 12. Coin Battles are returning! 13. Stamina Battles are returning! 14. All Special Smashes are returning! 15. The ability to change what items appear and how often they appear is returning as well. 16. My Music is a feature that allows you to customize the odds of a certain song playing at the beginning of any stage. 17. Menu Music is also customizable. 18. The Wii U version boasts a plethora of songs from all over Nintendo’s library of games. 19. There are so many composers that a flat out CD would cost more than the game itself! 20. CDs are returning as a primary way to unlock songs. 21. The 3DS version introduced Challenges, an achievement system that rewards the player with new moves for characters and other cool stuff! 22. Two Players are now able to work together in Classic Mode and get two trophies at the end. 23. After clearing Classic Mode, each character gets its own unique completion movie. 24. All-Star mode is different and allows 2 player co-op. 25. Event Mode debuts. A mode that puts the player through a maze of challenges. 26. Instead of Smash Run, the Wii U version gets Smash Tour. A board game inspired mode where the players advance across the board as Miis to collect power ups and characters to use in battle. When two players meet on the board, all players fight! If you win, you can steal fighters! The final battle is a stock battle that ends when all characters are destroyed. 27. Target Blast is confirmed for the Wii U version. The only difference between this one and the 3DS version is that the second bomb is larger and heavier. 28. 4 players can play in stadium modes! 29. Master Hand and Crazy Hand have modes called Master Orders and Crazy Orders. In these modes, you have three tickets to choose from, each have their own special rules. 30. Master Core is confirmed for the Wii U version! But has a fifth form, Master Fortress. Which is a maze form of the final boss. 31. Smash Bros is compatible with more controllers than any other Nintendo game. The Wii remote Plus, Wii U Gamepad, the Wii Classic controller and Pro, Wii U Pro controller, Nintendo GameCube controller, and 3DS. Controller configuration is now changeable. 32. On top of a GameCube controller adapter for the Wii U, a Smash Bros Edition of the controllers will also be available. 33. Nintendo 3DS and Wii U connectivity confirmed… Again. 34. Customized fighters on the 3DS can be transferred to the Wii U. 35. The Wii U version has the largest number of trophies to collect. Completionists beware. 36. Final Smashes are a thing of beauty and now have their own trophies. 37. Trophies can now be displayed in trophy boxes to keep all your trophies organized. 38. Photo Studio is a mode that lets you make dioramas out of your trophies. 39. Trophy Rush will now allow 2 players. 40. Masterpieces is returning, a mode that allows you to play small portions of retro games that you can purchase in the eShop. 41. Amiibo figures will learn and level up as you fight them. 42. The Wii LAN adapter is compatible with the Wii U. 44. Two players on the same Wii U can team up for online play. 45. ONLINE TOURNEYS CONFIRMED!… But it’s not finished yet. Online tourneys will be released later. 46. Tournaments allow for up to 64 players and/or CPUs to compete for survival. Replays are viewable at the end of the tourney. 47. The Wii U Gamepad can either display the screen or the damage percentage of all players. 48. Taking pictures is not only confirmed, but can be decorated from the Gamepad which can be uploaded online in a later update. 49. The Gamepad microphone can be used to communicate with friends online, but not during fighting to help prevent lag. 50. The Wii U Gamepad will be usable in Stage Maker! 51. (What? 51?) Everything that is customizable is shareable online! 52. (What? They said 50!) Movies will include all of the “Joins the Fight” clips. 53. (They count like Microsoft…) anyone who purchases both Smash Bros for 3DS and Wii U and registers them on Club Nintendo get the soundtracks from the games! 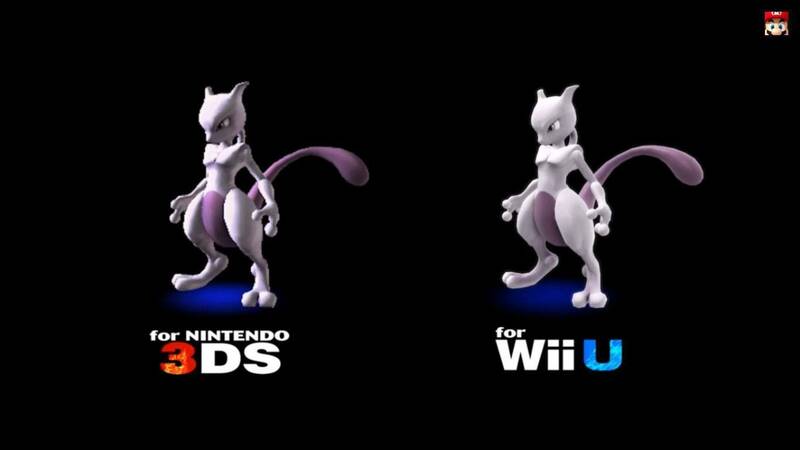 MEWTWO is confirmed! He is still in development and is a free download if you bought both games. He will join the fight in Spring of 2015.